A quick heat is the nicest thing you can expect when you come from outside and it’s freezing cold. It may even rain or snow. A quick heat such as a fan heater, night storage heater, electric heater or infrared heater. But maybe you just get a radiant heater for a short while so that you can stay outside for a little longer. Or you can quickly make a patio heater or heated mushroom. It is also nice if you can make yourself comfortable in an infrared cabin and let the soul dangle with an aromatherapy. On this page you will find detailed information, product ideas, news, comparisons and offers around the fast heat. The aim is also to get these products at a good price / performance ratio. Infrared heaters belong to the radiation or heat wave heaters and have been mainly used in industrial halls. Infrared heating has also become increasingly popular for private homes for some time now. For this, the emitters are placed behind a protective layer to prevent burns during brief contact with the hot heater and thus make it suitable for the home. The heaters are produced in many different variants as surface, mirror, picture or sphere, fixed or transportable. Due to the uniform radiant heat, the low air movement and the associated lower heating demand, infrared heaters are often used in large or poorly insulated rooms. In contrast to conventional radiators, it is not the room air that is heated in layers, but only the illuminated bodies, which then release the heat again. What is an electric heater? A technical heating system without a boiler and pipes to be laid, which is used to heat rooms in buildings or, by means of a water heater, to heat drinking water. The heat generation takes place in hot water decentralized, that is, in each individual water heater, instead. The power from the household socket is used as energy source. The heat generated and emitted by the electric heater is also called electric heat. Electricity heating or electrical building heating are other terms for the colloquially short mentioned electric heating. 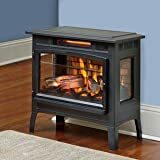 What is a night storage heater? The night storage heater is an electric heater that has a heat storage. This is fed by the low tariff, which is usually offered at night (sometimes in the afternoon) by the electricity providers at a very low price. During this time, the heating stores the energy and releases it during the day in the form of heat. Therefore, the night storage heater got its name because the generated heat is stored in the night hours and then used during the day. To operate the night storage heater requires two different meters at the end customer, once a normal electricity meter for the high tariff / Tagstrom and another for the low tariff / night electricity. The switching between the two tariffs and types of electricity is taken over by the electricity provider, usually by a sound frequency or timers in the main distribution box. Especially in the 1960s and 1970s, this form of domestic heating was very popular because the electricity providers had an oversupply of electricity and could deliver it in the weak times, so at night, at low prices. Thus, the power grid was evenly and constantly utilized. The oil crisis also boosted demand, as electricity as an energy source promised independence from the oil market and fluctuating prices.